For Contrarian Bets and Undervalued Gems ( especially small caps from erstwhile Regional Stock Exchanges ( now closed ) please consider Metropolitan Stock listed shares. When asked if it would lead to consolidation, he ( SEBI Chief ) said that might or may not happen. PLEASE DO NOT TAKE ANY INVESTMENT DECISION BASED ON THIS. Tata Steel Rights Issue in January 2018 ?? Tata Steel earlier named The Tata Iron and Steel Co. ( TISCO ) was formed in 1907. The massive and costly steel plant being put up at , now named , Jamshedpur required shares to be issued to the public for financing. The Management , initially , opened the public issue in England. The response was not encouraging. Then they decided to try to sell their shares to Indians. Tatas write in their history that the response was overwhelming and unprecedented. Would be investors queued before Tata 's office in Bombay ( Mumbai ). They brought with them tiffin and stools to sit on while waiting in the line.
. All the shares were sold. Industrialists saw the hitherto , untapped potential of Indian investors and the Indian capital waiting for investment. Entitlement ratio for Partly Paid Shares – 2:25 ( for every 25 shares held as on record date, the entitlement is 2 Partly Paid Shares) Amount payable per equity share(Partly Paid) on Application: @ Rs154/- per share. 1) You can check for application form dispatch details on our website, https://linkintime.co.in/rightsissue/rightsissues-Knowyourapplication.aspx by providing your folio no/ CAF NO. 5) Shareholders can opt to apply through ASBA. ASBA application need to be submitted to their respective ASBA bankers only. For the list of participating SCSB banks for ASBA , please click on the link, https://linkintime.co.in/rightsissue/rightsissues-Knowyourapplication.aspx . 7) You can send application form along with cheque / DD to our Mumbai office – Vikhorli address, if collection center is not accessible to you. • For split request, please fill up Part D of the application form and send a scanned copy of PART D through email to our email id, tatasteel.rights2018@linkintime.co.in and also send hard copy of the signed application form, to our (Vikhorli) address. Split request will be dispatched only after receiving the hard copy of the application form. 247, Corporate Park, C-101, 1st floor LBS Marg , Vikhroli (west) Mumbai- 400083. • NRI applications on plain paper format shall among other things, be subject to conditions, as may be imposed from time to time by RBI under, FEMA. Note: This is a general acknowledgment mail which answers most of your queries regarding this Tata Steel Ltd. -Rights Issue. Any query apart from what is mentioned above will be answered separately. Primary Market- IRC | Link Intime India Pvt. Ltd.
"TATA STEEL FULLY PAID RIGHTS ISSUE ESCROW COLLECTION-R "
"TATA STEEL PARTLY PAID- RIGHTS ISSUE -ESCROW COLLECTION-R "
"TATA STEEL FULLY PAID- RIGHTS ISSUE- ESCROW COLLECTION-NR "
"TATA STEEL PARTLY PAID- RIGHTS ISSUE -ESCROW COLLECTION-NR "
We trace our history back to the establishment of a Brewery at Kasauli by Edward Dyer in 1855. He was the India’s brewing pioneer who brought to this sun-drenched land of ours the bliss of a real thirst quencher – the modern beer, to refresh and pep up a people hanging over in sweltering clime that is so peculiar to this part of the World. He realized for the first time that there were a few spots on earth where a really good drink was more welcome. But, in his flush of enthusiasm he had set before himself such a big task of quenching the thirst of a nation as obviously could not be expected to reach fulfillment by his one, howsoever efficiently working brewery at Kasauli. Consequently, with ardourous zeal he scaled the whole width of this subcontinent and established breweries and distilleries at Simla, Solan, Lucknow and Mandalay (Burma). During the same century, another enterprising man, named H.G. Meakin, coming from a well known brewing family of Burton-on-Trent where he was trained, came forward with enviable enthusiasm and founded Meakin & Co. Ltd. He bought the old Simla and Kasauli Breweries and built others at Dalhousie, Ranikhet, Chakrarta, Darjeeling and Kirkee. Both these firms E. Dyer & Co., and Meakin & Co. Ltd., continued doing business separately up till after the second decade of the 20th century. During the first World War (1914-18), when it was a big job to import beer, the two firms quenched the hugely increased thirst of India with superb beer at a rock-bottom price. Vast quantities of Malted Barley were sent to Egypt, to help keep soldiers’ beer at a reasonable price. Following these successes, the two firms joined hands and started a new joint stock venture under the style of Dyer Meakin & Co.Ltd. Brewing was suspended at the Kasauli Brewery and a latest brewing and bottling plant was installed at conveniently placed Solan. Extensive malting at Kasauli were, however, continued in operation. There are few places on earth where the water is ideally suited to brewing. Solan is one. Those who fancy the hill-climb would like to see our famous springs high up on Karol Mountain, far from everything, a lovely lookout, with the source of crystal clear spring water that drew our pioneer to Solan. With the times, as modern scientific progress made it possible to augment production several times with the latest machinery, the unproductive centres were closed down one by one retaining distilleries at Kasauli and Lucknow and brewery at Solan (Simla Hills) ; all the three centres enormously expanded to meet any expected demand. During the World War II, Solan Beer played its valuable part by keeping the soldiers of the allied nations in perfect pep and cheer. After the War, all manufacturing plants at Solan, Kasauli and Lucknow were replaced by the new latest automatic ones. With these improvements in production plans we invite our patrons to compare our products with the best of their imported counterparts and choose the better – Dyer Meakin’s. You see these are now nation’s own. In 1935 when Burma was dismembered from India the name of the Company with Indian assets and liabilities was changed to Dyer Meakin Breweries Ltd., from Dyer Meakin & Co. Ltd., and the assets and liabilities of Burma Brewery in Burma were separated. Thereafter the Company’s name was changed from Dyer Meakin Breweries Ltd., to Mohan Meakin Breweries Ltd., w.e.f. 1.11.1966 and from 24.4.1980 the name was further changed to Mohan Meakin Ltd., and as such the Company is now known as Mohan Meakin Limited. Year 1949 saw a dynamic transformation in the fortunes of the Company, with late Padamshree N.N. Mohan at the helm of affairs. With his far-sightedness he set up big industrial hub near Ghaziabad (U.P.) known as Mohan Nagar by establishing there various manufacturing Units namely Brewery, Distillery, Malt Houses, Glass, Ice, Break-fast Food, Fruit Products and Juices, Malt Extract factories, Cold Storage and Mohan Engineering Works etc. and there has been no looking back since then. The Company’s remarkable performance is not limited to liquor, its business interests are manifold. Turning foresight into reality is the Fruit juices, Breakfast Foods, Mineral Water and Glass Factory – a strategic diversification to further re-inforce its business interests. His eminent successors have borne the mantle with elegance. Instilling upon the Company the strength of purpose, corporate values and a sense of direction, they have reached new heights. Aptly mirrored in Mohan Meakin’s swift march towards progress and its phenomenal growth. The Challenges of the present are ably met by Padamshree Brig. (Dr.) Kapil Mohan, VSM (Retd.) Ph. D., under his stewardship, the group rechristened as Mohan Meakin Limited, undertook major diversification with 3 distilleries in India and 2 breweries and a host of franchises. A multi-faceted business house with a turnover exceeding INR 400 crores, Mohan Meakin stands for growth, innovation and care. It appears some shares of Mohan Meakinare available with Dealers of Unlisted / Delisted Shares (Please Recheck this ). MAKE Metropolitan Stock Exchange WORK. 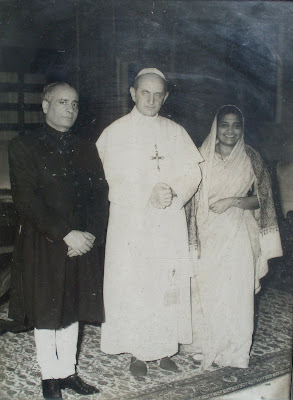 Dewan Brij Kumar IFS ( Maternal Uncle - Mamaji of the blog writer) and Mrs. Pushpa ( Maternal Aunt -Mamiji) with the Pope. Dewan Brij Kumar was India's Ambassador to the Vatican. Binani Inds holds nearly all the share capital of delisted Binani Cement. Binani Cement has been valued atRs.4000 cr. NB :All information given in good faith. Please recheck every point before taking an investment decision.No responsibility with this blog / blog writer. Kurlon Promoters Selling Out ?? Gandhi Special Tubes Buy Back ?? Riddhi Siddhi Gluco Biols -To Delist ? ?